Former Prime Minister Yingluck Shinawatra lights the ceremonial cremation fire for Apiwan Wiriyachai, who served as her Deputy Prime Minister before the coup that deposed the elected Pheu Thai government. Thai funerals can last a week or more. The higher a person's standing in the community, the longer funeral rites go on. Apiwan Wiriyachai, the former Deputy Prime Minister who died in exile in early October, was a person of distinction. In addition to his political role as Deputy PM, he was also a graduate of the Thai military academy. Thousands of people attended his funeral. A small part of the crowd at Apiwan's cremation. Former Prime Minister Yingluck Shinawatra presided over the funeral. 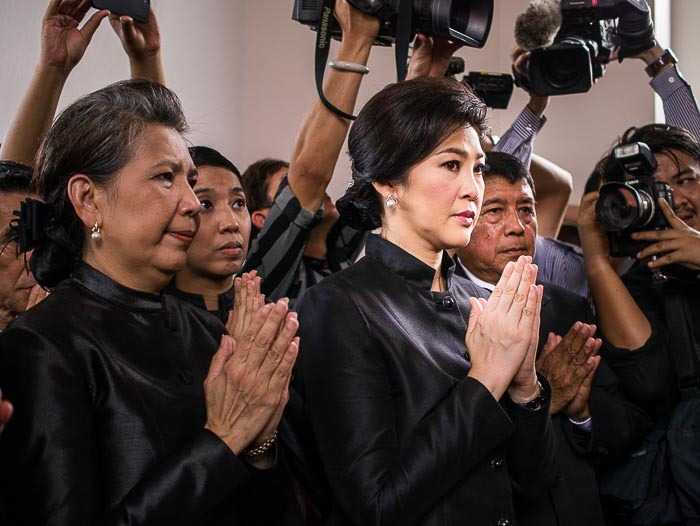 Yingluck has made only limited public appearance since the coup deposed her government (technically, she was ousted by the courts in early May. The May 22 coup deposed the interim government serving in her place). She's traveled outside Thailand to see her brother, former PM Thaksin Shinawatra, but otherwise she's mostly been seen in shopping malls and grocery stores. 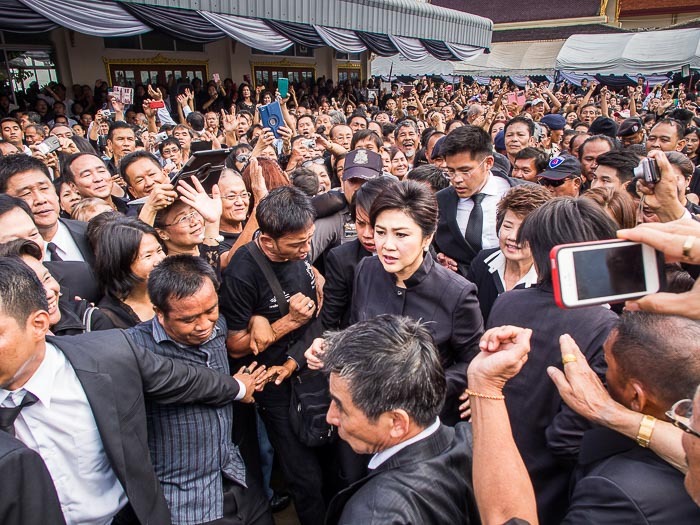 Yingluck walks through the crowd at the funeral. Rounds of applause erupted as she walked into the ceremony to greet Apiwan's family. The military government said Apiwan could have a public funeral on the condition that it was religious only - no discussion of politics. The Red Shirt leaders at the cremation Sunday were as circumspect as they were at Apiwan's bathing rites last week. They posed for photos with members of the public but they didn't make any speeches or public comments. I was within a meter or two of Yingluck during the cremation and I didn't hear her say a word. A woman prays during Apiwan's cremation. 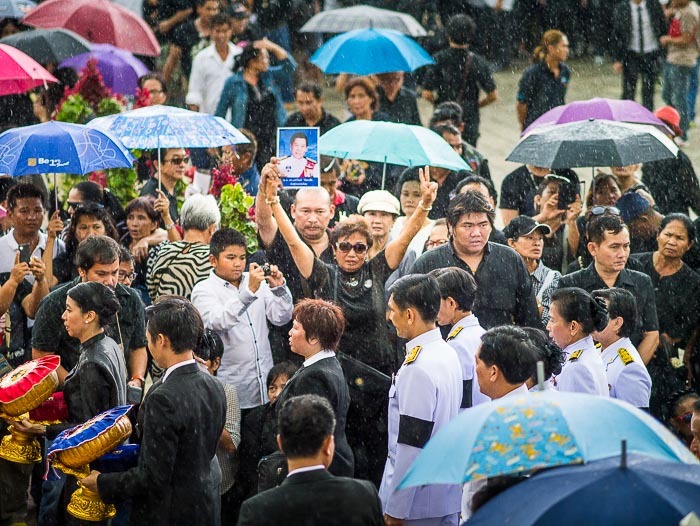 A mourner holds up a photo of Apiwan as his family walks past her during the funeral procession. The funeral started in a torrential rain storm, but the clouds parted and the sun came out when the former Prime Minister arrived. I'm sure it was coincidence. 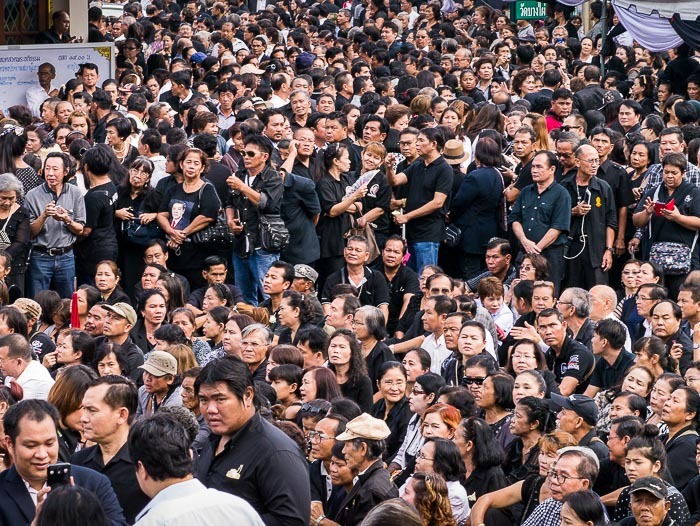 Although the Red Shirt political leaders were mindful of the junta's mandate of a politics free funeral, the regular folks, the vast sea of Red Shirt mourners that filled the temple grounds, were undeterred. Some proudly wore their red shirts. Others held up the unofficial Red Shirt three fingered salute, borrowed from the Hunger Games movies. 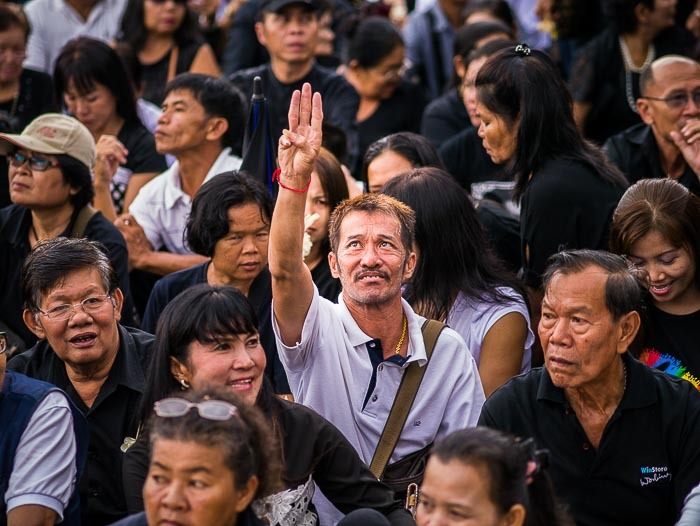 A mourner flashes the three fingered Hunger Games salute. As I walked through the crowd, Red Shirts who recognized me (I've been covering the Red Shirts for years now. Some of them recognize me and I recognize some of them) came up to talk to me about the situation. I tried not to be rude, but I don't engage in political discussion here anymore. The situation is too complicated. When people asked what I thought, I offered my condolences and moved on. 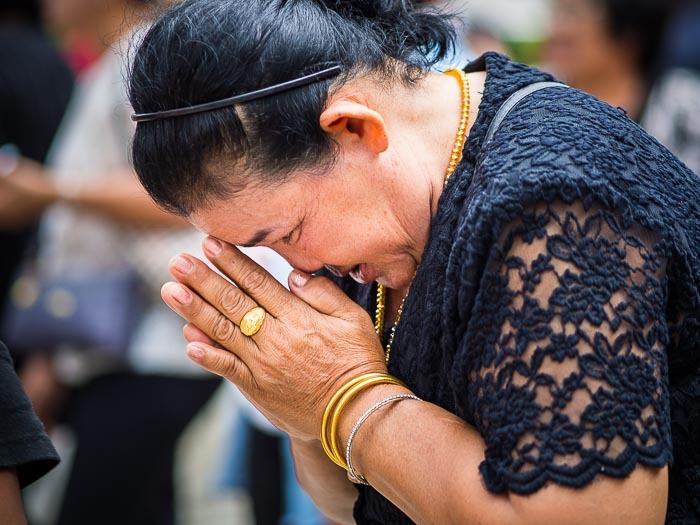 Ratchanee Wiriyachai (left) widow of Apiwan Wiriyachaiat, and former PM Yingluck Shinawatra pray during Apiwan Wiriyachai's cremation at Wat Bang Phai in Bang Bua Thong. 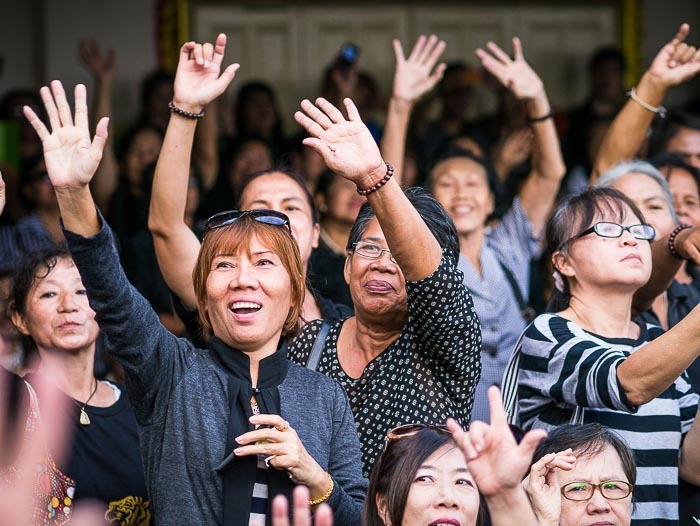 Women cheer for Yingluck during the cremation. The cremation was the largest, most energized gathering of Red Shirts since the coup in May. I don't know what this means for Thailand going forward. Public political gatherings are still banned and martial law is still in place. I don't see the Red Shirts taking to the streets to protest against the government. There are more photos from the cremation in my archive or available from ZUMA Press.